Lovely place Buxton. A northern version of Bath. ‘Bath’ in its Regency architecture, spa baths and thriving Arts festival. ‘Northern’ in its capacity to snow in June and force cancellation of a county cricket match (June 1975). Google Buxton and you’ll find great guides to all it has to offer. 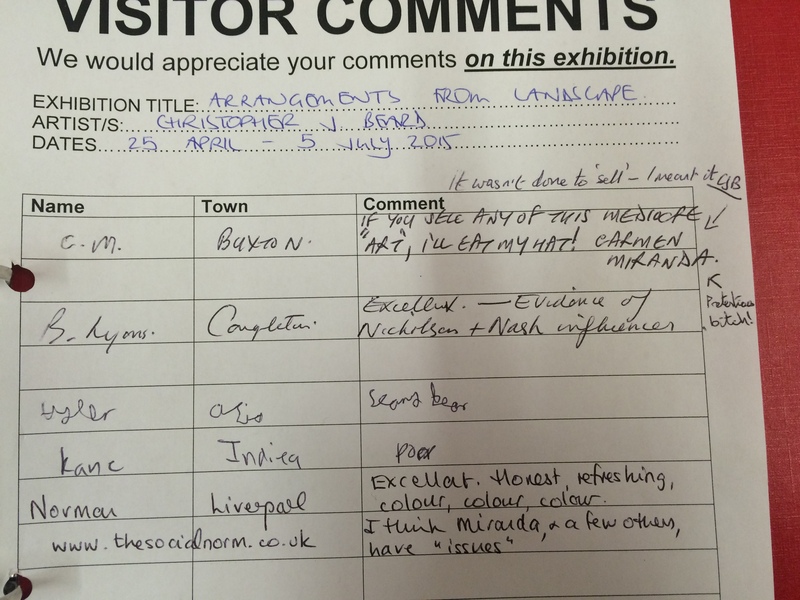 I popped into the small but perfect Buxton Museum and Art Gallery and found the ‘artistic temperament’ alive and well in the Visitors’ Comments section of one gallery. It’s good to see debate on the merit of Art is not just reserved for perhaps pretentious, London literati types but thrives here in North Derbyshire. Apologies to any of my London Literati friends. It’s just I liked the two Ls and did it for the ‘L’ of it. Alliteration lives. With reference to the above, this Blogger does not use mind altering drugs, unless you count having a season ticket for Preston North End which, as we have already established, can lead regularly to emotions ranging from ecstasy to despair. (Editor’s note: it’s summer). I don’t think you can get more eccentrically British than the sight of a giant teapot closing the A53 – one of the most dangerous roads in Britain. (Google it). 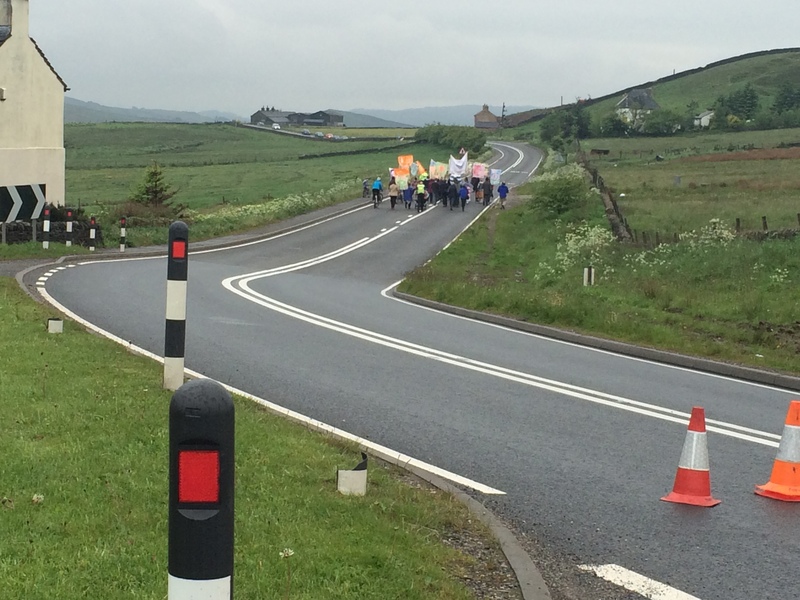 The A53 skirts round Flash – the highest village in England a short way from Buxton. In 1846 long before the NHS, the good folk of Flash village formed a Friendly Society ‘The Loyal Flash Union’ which became known as the Tea Pot Club because the money was collected in a teapot. Appropriate perhaps in this area where Methodism thrived. Being a member bestowed benefits if you were ill or could not afford to pay for your funeral. Hard times which I trust our current Government will not take us back to. Forget what I said about Methodism. The Teapot parade has been making its way to the Travellers’ Rest pub (now renamed ‘The Knight’s Table’ I have to ask why???) for ‘refreshments’ for over a hundred years. It was from the pub that I saw the parade make its way down the A53 – temporarily closed by the police. A great sight. 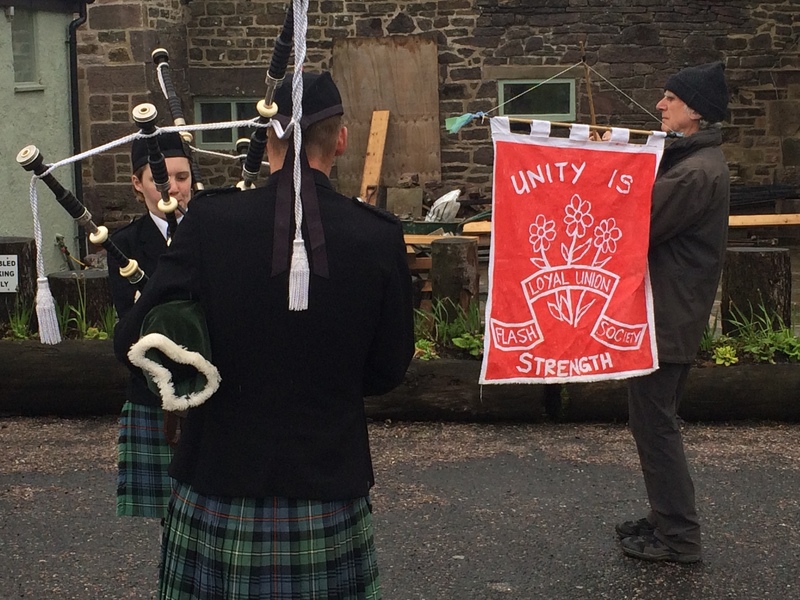 A teapot, Bagpipes, two Church of England clergy quite rightly bestowing their blessing on this essentially philanthropic organisation. Well done Flash! 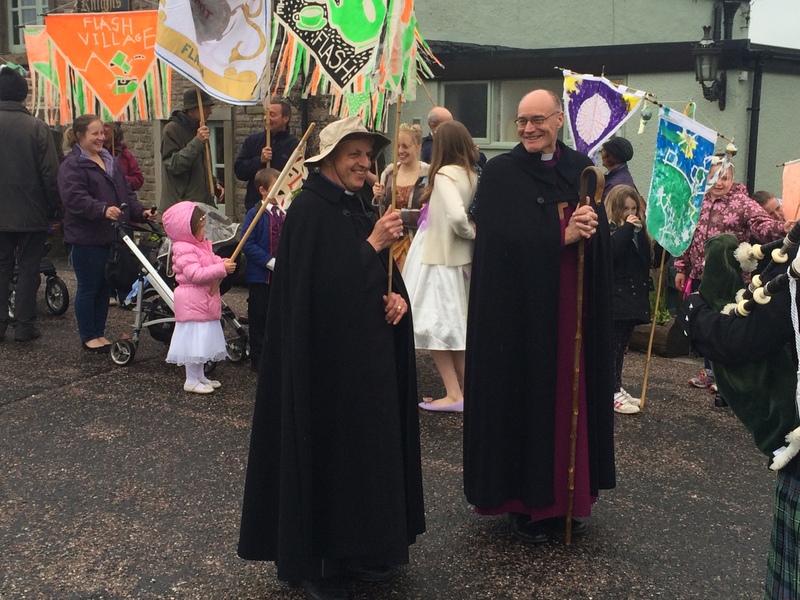 I still think there is something vaguely pagan about our two clergy. Perhaps this will rejuvenate the Church to discover its Druid roots. More of that another time perhaps. Here’s a few pics in case you thought I was making it up. We love the Scots you know – seriously. 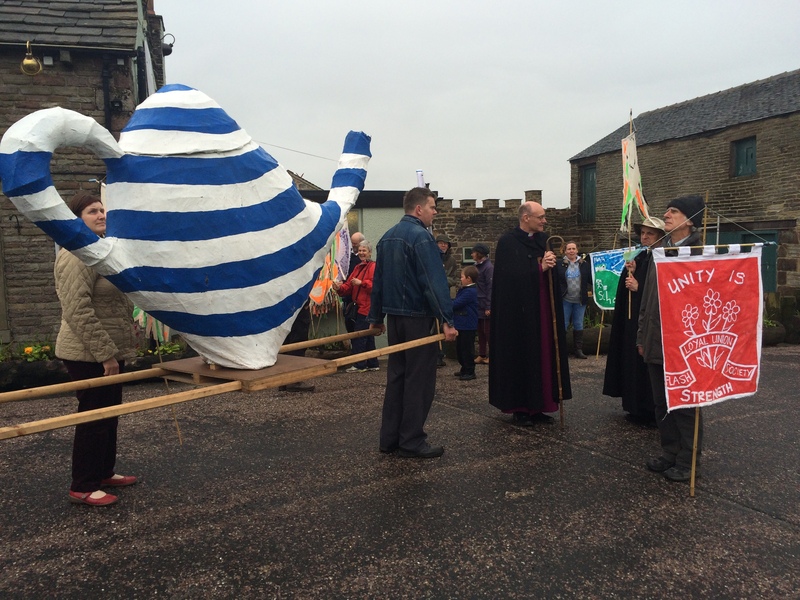 Well done the Teapot Parade. Keep it up.